Puls Biznesu and PwC Poland awarded us with the 2018 Ethical Company commendation. We thank the jury for the award, and the team, clients, partners and all funs for your support! We were one of only two small companies and the only consulting and training company awarded. 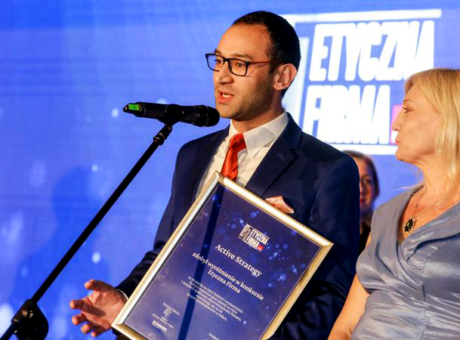 This is important award because even though we are a small team, we have the pleasure and honor to work with great people from Polish and international companies. We work in a very poorly regulated industry. Except the law applicable to all companies in Poland, there are no required certifications or permits (ie in banking, medicine or psychotherapy) or technology (ie in IT or manufacturing). Nothing imposes requirements on us, we do not have to apply any standards. Everyone can be a consultant or trainer. That is why it is so important for us to build these standards by ourselves. We support companies in improving the quality of leadership. Trust and credibility is key for our clients. What are we formally doing in the field of ethics? We have a written Code of Ethics and Compliance in our Culture Book - Active Strategy Consultant Handbook. Contains rules regarding tolerance, respect, conflict of interest, corruption, compliance with the law, confidentiality. We always pay consultants, partners and suppliers on time (usually ahead of schedule). While selecting people for the team, we ask about the approach to work, people, business, tolerance and ethics. Later we pay attention to whether it is like during recruitment. We do not agree to cheating, discrimination, disrespect. We have been able to terminate our cooperation with a trainer inconsistent with our ethical principles. Despite good customer opinion. If we make a mistake (happens even to the best one), we apologize and if possible compensate. Sometimes we do not accept orders. We are very cautious about some industries. We tell customers about the risks or weaknesses of the ideas that they come to us with. We honestly tell clients what competences we have and which we do not. We do not provide to the supervisor or HR with observations about training participants if they have not been informed beforehand that we will do so. By solving dilemmas we return to the values ​​and Culture Book. We do not gossip about customers, suppliers or competitors. Of course, we discuss specific situations. We support good competition, sometimes we cooperate, we never digs a pit for others. (Here, companies from the Lower Silesian ITCorner cluster are a great example for us). We respect open, transparent communication in the team and outside. We support NGOs (free or at cost) - we make small donations, we have conducted trainings for Aiesec, 'Project Management' Students Society, 'Your New Opportunities' Association and coaching for coordinator from Doctors of the World in Sierra Leone. (These are not employer branding activities, because we do not recruit people with such profiles). Maybe these are trivialities, maybe obviousness, but this is how we work. This award fills us with pride and at the same time is a kind of promise. Ethical Company commendation is appreciation for many difficult decisions and at the same time it is raising the bar. We must maintain the level. Ethic is not slogans on the company walls, but everyday smaller and bigger decisions!